Packing lunches can get pretty old and monotonous. The kids eating those lunches might start to get a little bored with monotonous lunches too. Well, here's a week's plus of exciting new lunchbox ideas that go beyond the peanut butter and jelly sandwich and apple lunch. From salads and soups to kebabs, these lunches aren't hard to prepare and they will keep the kids happy. A couplet things to have on hand for packing lunches are, of course, a lunchbox. If you can get one that has some insulation it will help to keep cold things cold and hot things hot. Also, instead of relying on disposable baggies to pack lunch items in, invest in some reusable lunchbox kits that usually come in different sizes and have different compartments in which to pack foods. That way you can keep foods from becoming soggy and mixed together. 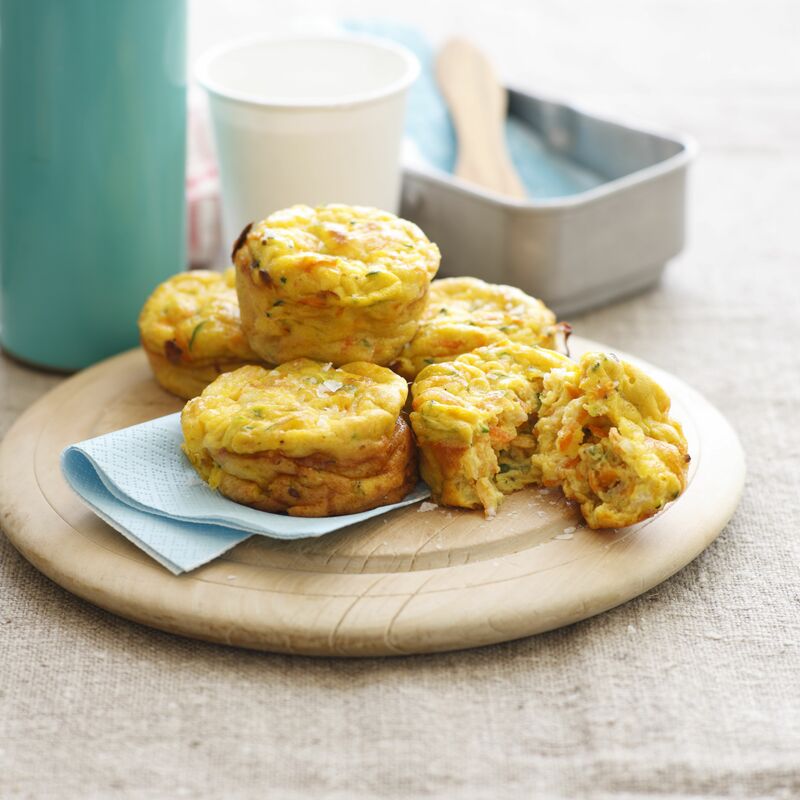 You will really be taking lunch up a notch when you pack these delicious little two-bite mini frittatas. While you may not want to take the time to prepare them in the morning before school, prepare a double batch the night before and serve some for dinner and keep a few aside for lunches the next day. A fresh fruit salad and a small bagel or roll rounds out the meal. Hummus makes a terrific lunch because it is so full of nutrition, and so many good things can be dipped in hummus. This lunchbox meal includes hummus with pita bread and lots of fresh vegetables for the kids to dip with. There's something about dipping that kids just absolutely love, so you can bet your kids will probably be eating their vegetables on this day. You might not think that a salad would be a first choice for a kids lunch. But, when a chef salad is packed like this with all kinds of yummy things for kids to top their salad with, you might just have kids who request salad for lunch! This lunchbox lunch is sure to please the majority of kids because there is so much sweetness in this fruity yogurt parfait with granola. But, though it is sweet, it is loaded with nutrition from protein in the yogurt and fiber and all kinds of nutrients in fresh fruit. Carrots and peanut butter round out the lunch. Kids will look forward to pizza wrap day. The concept is really simple, and you can make these pizza wraps healthy by using whole grain tortillas and part-skim mozzarella cheese and tomato sauce for toppings. Salad and fruit leather made from real fruit are fun ways for kids to eat lots of fruits and vegetables for lunch. What child doesn't like a toasted cheese sandwich? But how many thought they could have grilled cheese packed in their lunchbox? It is possible to do it and make sure it still tastes good by the time lunch rolls around. Serving it with a mug of warm tomato soup makes for a really wholesome and satisfying lunch. The soup provides lots of healthy vegetables so you can feel really good about what you are sending for your children's lunch. Brown Bag Lunch Menus That Will be Eaten at School!